Is It Finally Time For The Scariest Man Alive? Tonight, on HBO pay-per-view, the next great arms race in boxing formally gets underway. Just over five months removed from the biggest financial success in its history, boxing finds itself in a not uncommon but certainly uncomfortable position: without a signature star. For all the money it generated, the Floyd Mayweather, Jr. vs. Manny Pacquiao superfight effectively destroyed the marketability of both of its combatants. Mayweather lost the interest of casual fans by doing what he always does, winning easily without really trying to do anything to impress or entertain, and then taking a gimme fight against 30:1 underdog Andre Berto before announcing the third retirement of his career. Pacquiao, although he will purportedly fight on, also saw his marketability greatly diminished by a disappointingly lackluster performance, would later blame on an undisclosed and untreated injury. With those two men, who’ve dominated the sport’s box office for the past eight years, out of the picture, and America showing more interest in Hayden Panettiere’s post-partum depression than the career of her husband, Ukrainian heavyweight champion and Goliath look-alike, Wladimir Klitschko, the sport needs to find its next crossover superstar. Up first is the top choice of many, and the star of tonight’s main event, the undefeated Kazakhstani knockout artist, Gennady Golovkin. You may have heard some buzz about Golovkin. Hamilton Nolan called him “the scariest man alive” when he profiled him here two years ago. On paper, there’s a lot that supports Nolan’s claim. 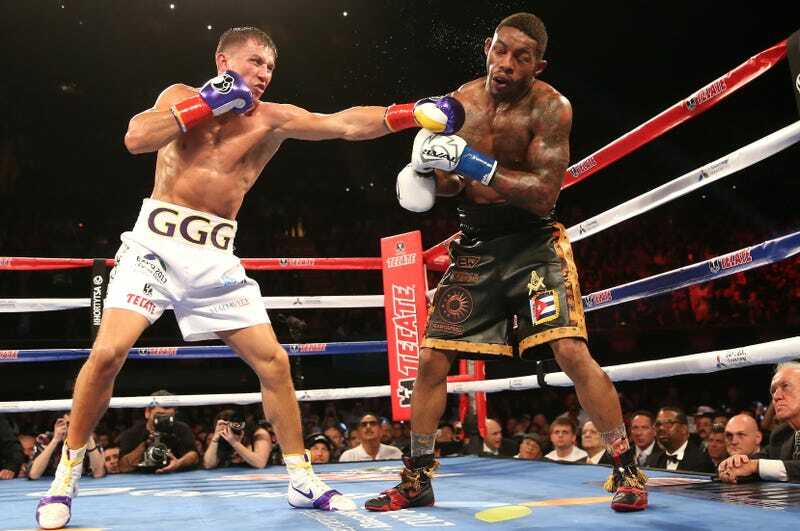 Golovkin—GGG, to his fans—has a truly remarkable record: 33-0 with 30 wins coming by way of knockout. His last win by decision came in only the thirteenth fight of his career, an eight-rounder in Denmark back when George W. Bush was still president. Since coming to the US in 2012, Golovkin has cleaned out the middleweight division, barely losing a round along the way. And yet, for all his success, he hasn’t really elevated his profile in the process. He’s still a guy a lot of casual fans probably know best from that 2013 Hamilton Nolan profile. How is that possible? For one thing, while all Golovkin’s fights end in knockouts, they’re not often the sort of knockouts that drive casual fans nuts. Golovkin fights in a way that evokes memories of the great Julio Cesar Chavez, Sr.—he relentlessly breaks his opponent down with a continual barrage of thudding punches, rather than relying on a single blindingly fast punch, in the style of Mike Tyson, the last box office king who was a true knockout artist. Tyson’s opponents seemed to go from living to dead before their bodies hit the ground, like they’d been struck by a bullet; by contrast, Golovkin saps the will of his opponent until their lifeless body simply seems to give way, like the empty cloak of Obi-Wan floating to the ground with no physical substance remaining in it. And like all things that require time to come together, the knockouts scored by Golovkin don’t lend themselves to a highlight reel quite as naturally as the split second, life-altering punches delivered by Tyson and his ilk. There’s another thing working against Golovkin, and again Chavez makes for a useful analogy. Chavez had a truly legendary career, and inspired god-like reverence from his massive Mexican and Mexican-American legion of fans, but he never truly crossed over into being a mainstream star. Part of this was due to fighting in the shadow of Mike Tyson for much of his career, but another part can probably be chalked up to the fact that Chavez didn’t seem to much care about appealing to people outside his core fan base. He never spoke English in his interviews, never did U.S. media appearances, and seemed generally content to let his fists do his talking for him. To some extent, the reserved Golovkin—who does speak good English—seems happy to do the same. He is calm, polite, and dignified, all of which are lovely qualities in a human being, but none of which sell fights in the way the brashness of Ali or Mayweather, or the uncontrolled fury of Tyson, did. Of course, it’s not impossible to be both nice and a box office draw in boxing. Evander Holyfield, Manny Pacquiao and Oscar De La Hoya all presented themselves as good guys to the boxing press (whether or not this reputation was always deserved) and all became the biggest draws in the sport for a time. But each of those men had qualities that Golovkin does not. Holyfield was the humble David who slew boxing’s Goliath, Mike Tyson. He personified the heroic triumph of the good and humble underdog over all that was evil and corrupt in the sport. And, besides, he was heavyweight champion when that title still meant something - when it wasn’t just a leftover bauble because any hard-hitting athletic big man was playing football, instead. Pacquiao was once the most electrifying figure in the sport: whirling and spinning, seeming to leap across the ring in the blink of an eye, throwing punches from every imaginable angle and some which could not even be imagined, all while refusing to back down no matter how much punishment he absorbed. As Pacquiao matured in the ring (and his output diminished), he compensated by becoming a multimedia sensation; his singing performances on Jimmy Kimmel sometimes got as much attention as his actual fights. And De La Hoya was, is, and always will be our Golden Boy: the local kid who made good, who saluted his beloved late mother before every fight, and who shared a screaming teenage fan base with the Backstreet Boys. Christ, the guy even was nominated for a Latin Grammy. GGG, for all of his in-ring ability, has not yet shown he can connect to the public with a narrative anything like those men. At age 33, Golovkin is running out of time to seize the throne. He’ll make his bid tonight against David Lemieux, a Québécois fighter with a fairly nifty knockout percentage of his own, but with nowhere near the polish or history of success of GGG. Back in 2011, Lemieux lost two fights in a row, the first to Marco Antonio Rubio, who was later knocked out by Golovkin, and the second of which came at the hands of Joachim Alcine, a solid but fading fighter, who proceeded to then lose his next five fights in a row (the first of which came at the hands of Matthew Macklin, another one of Golovkin’s many knockout victims). While Lemieux has rebounded well since, it doesn’t take an expert eye to see that Lemieux is a massive underdog tonight, which is precisely why he makes such a perfect foil for Golovkin’s debut as a pay-per-view headliner. And this brings us to the final strike against Golovkin, for all his success, he has yet to face a signature opponent, a fighter with the stature to escalate him to the next level. Until he does, it’s tough for fight fans to say whether Golovkin is the horrifying force of nature that Hamilton Nolan witnessed two years ago, or just a big scary fish in a small pond. Should you spring for the fight tonight? Absolutely. It should make for a great clash, as long as it lasts. Lemieux knows his only chance is to go for the knockout and Golovkin, well, he doesn’t know how to fight any other way. But don’t tune in tonight if you want to see the next Floyd Mayweather or Manny Pacquiao. Golovkin just isn’t that guy, and he’s not going to be. You’ll need to wait at least one more week for that, when (in my view) the best fighter in the world today, Terrence “Bud” Crawford returns to the ring on HBO World Championship Boxing. (That one is for free, too.) Nope, tonight you should just tune in and enjoy this generation’s Julio Cesar Chavez. And, for the scariest man on the planet, there shouldn’t be the need for any praise higher than that.